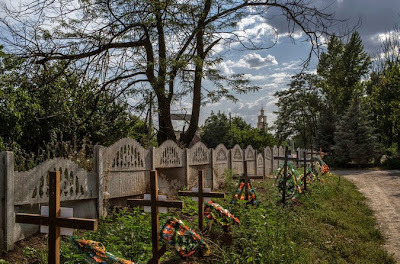 SLOVYANSK, Ukraine -- On an overcast day in April, staff members at the municipal museum in this eastern Ukrainian town noticed strange goings-on next door at a cultural center run by the Ukrainian arm of the Russian Orthodox Church. Groups of burly men nobody recognized entered the building, known as Villa Maria, carrying big canvas bags and wooden boxes. “We didn’t know who they were or what they were doing,” recalled Valery Stupko, a museum employee. The next morning, he said, heavily armed masked men emerged from the same church cultural center and made their way on foot through back alleys to Slovyansk’s main police station. Within minutes, they had seized the police station and helped ignite what became a brush fire of assaults by pro-Russian rebels on Ukrainian security and government buildings across the east of the country. The Russian Orthodox Church, like the Kremlin, has strenuously denied any role in stirring up or aiding separatist turmoil in Ukraine. But as Slovyansk and other towns seized by pro-Russian rebels have fallen over the summer to a since-stalled Ukrainian government offensive in the east, evidence has begun to accumulate of close ties between the church, or at least individual Orthodox priests, and the pro-Russian cause. “They were working hand in hand,” said Victor Butko, the pro-Ukrainian editor of a small newspaper here shut down by the rebels during their nearly three-month occupation of the town. He said priests at an Orthodox church in the center of town often blessed the rebel fighters and let them store ammunition on church grounds. Since they began their drive to grab chunks of territory back in April, pro-Russian insurgents have repeatedly shifted their political agenda, undecided over whether they want eastern Ukraine to become part of Russia, an independent country or an autonomous region of Ukraine in a loose federal state. Throughout, however, leaders have declared themselves bearers of the banner of “Holy Rus,” both a theological concept akin to the Kingdom of Heaven and a reference to a state in the Middle Ages that comprised the territory of modern Ukraine, Belarus and western Russia. Embracing Orthodox Christianity as a force to unite these now divided Slavic lands and also their own fractured movement, the rebels, fortified recently by an influx of weapons and soldiers from Russia, used their period in power here purging Slovyansk of rival Christian denominations. They seized the Good News Church, a large evangelical complex, moving in Russian icons and replacing Protestant services with Orthodox ones. They parked tanks in the center’s gardens and, blessed by Russian Orthodox priests chanting prayers, began lobbing shells at Ukrainian forces outside town. When the rebels fled, they needed two big trucks to haul all their weaponry. Petr Dudnik, the Good News Church pastor, said he did not know who exactly was behind the takeover but said it fit into a long campaign by the Russian Orthodox Church to portray competing denominations, particularly evangelicals, as a heretical fifth column inspired and financed by the United States. The Orthodox Church, like the Roman Catholic Church, traces its origins to the earliest Christian church established by the Apostles and, shaped by the different histories and cultures of its main strongholds in the eastern Mediterranean and Slavic lands, comprises a wide range of divergent views and political attachments. But unlike the Rome-based Catholic Church, from which it split in the schism of 1054, the Orthodox Church is divided into autonomous branches, with the Moscow patriarchate a particularly conservative and, in territory it judges bound to Russia by history, language and faith, assertive force. “We cannot ignore the fact that the conflict in Ukraine has unambiguous religious overtones” Patriarch Kirill I, the Moscow-based head of the Russian church and its Ukrainian affiliate, wrote in a recent appeal to Ecumenical Patriarch Bartholomew I in Istanbul, the Orthodox faith’s most senior cleric. Rival church leaders say there is indeed a religious struggle underway but insist its root cause is political and what they see as the Moscow patriarchate’s role as an instrument of Kremlin policy. “Patriarch Kirill has become part of the Russian government, and it is in this light that his words and actions should be perceived,” said Patriarch Filaret, the head of an Orthodox hierarchy based in Kiev, the Ukrainian capital. The Moscow church has avoided giving explicit support for separatist gunmen but made no effort to rein in pro-Russian fighters who, claiming to serve the Russian Orthodox Church, imposed a reign of terror on Slovyansk marked by murders, kidnappings and general thuggery. Among their principal targets were Christians defiant of the Moscow church’s claims of religious primacy and suspected of connections with the West. “Their logic is simple: You are an American church and America is our enemy so we have to kill you,” said Mr. Dudnik, the evangelical pastor. No one at his center had been killed, he said but added that the rebels had murdered four evangelical Christians from another Slovyansk church. Grabbed by pro-Russian gunmen in June after a Pentecost service at the Divine Transfiguration Church, all four victims were taken away for interrogation and were later found dead in a burned-out car. The Voice of Russia, a state-run radio station, asserted against all known evidence that they had been killed by the Ukrainian Army. Instigators of the rebellion, notably Igor Strelkov, a Russian former intelligence officer, embrace a radical strand of Orthodox tradition suffused with xenophobia, a passionate expectation of the Second Coming of Christ and a belief in Russia’s right and duty to rule the lands of Holy Rus. Strelkov, who commanded rebel forces in Slovyansk, fled in July to Donetsk, where he became “defense minister” of a self-declared separatist state. As regular Russian army units became more involved in the conflict late last month in a push to halt and then reverse Ukraine’s battlefield gains, however, Moscow appears to have turned away from rebel leaders whose religious zeal had given the separatist cause a fanatical and increasingly unpopular complexion. Strelkov suddenly disappeared after reports that he had been shot in a power struggle. Debunking rumors that he was dead, last week he popped up at an Orthodox monastery on an island near St. Petersburg along with Alexander Dugin, a Russian ultranationalist who champions the church as the core of a Russia-dominated new world order. Remembered in Slovyansk as a ruthless zealot, Strelkov waged a relentless campaign against not only evangelicals but also fellow Orthodox believers who refused to recognize the authority of a Moscow-based patriarch and instead follow the rival Orthodox hierarchy in Kiev. A single church commanded from Moscow during the Soviet period, the Orthodox church split after the 1991 collapse of Communism with the establishment of the Kiev patriarchate, whose current leader, Patriarch Filaret, has supported the Ukrainian government and denounced what he described as “numerous death threats” against his clergy and followers by pro-Russian rebels. 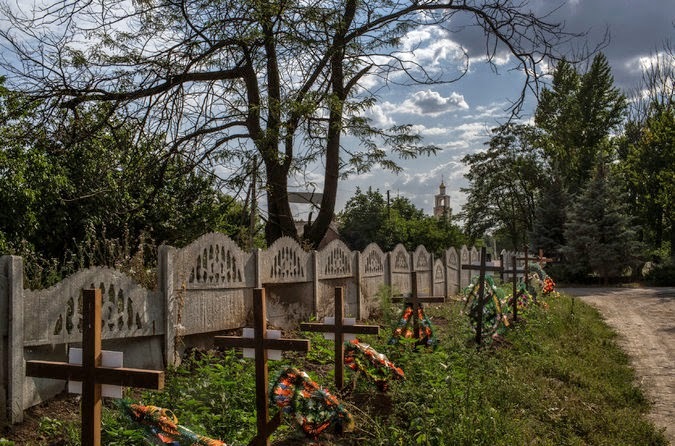 A month after Slovyansk fell to the rebels, a group of Russian Cossacks arrived at a Ukrainian Orthodox church on Karl Marx Street and announced that they were seizing the property in the name of the Cossack Orthodox Army, said the Ukrainian Church’s local head, Archimandrite Savva. “They said I was a charlatan and had no right to preach because only the Russian Orthodox Church can promote Holy Rus,” recalled the priest, who fled Slovyansk after being warned that pro-Russian gunmen wanted him dead. He returned after the rebels pulled out. The town’s Russian Orthodox priests have now themselves mostly disappeared, apparently taking flight to escape possible arrest by the Ukrainian authorities for their role in supporting the rebellion. Among those who have gone missing is Father Vitaly, a priest at Slovyansk’s oldest church, Church of the Holy Resurrection, which controlled the cultural center used by the gunmen. His staff said he was away on a trip and would return, though when was unclear. A telephone number they gave for him did not work. When pro-Russian gunmen first took control of Slovyansk, the town’s elected mayor, Neli Shtepa, who initially supported the takeover, said in an interview with Ukraine’s Unian news agency that Father Vitaly had welcomed the rebels onto church property to help them prepare their initial assault. She was arrested by the rebels soon afterward and spent three months detained in city hall. Archbishop Arseny of Svyatogorsk Lavra, the Moscow patriarchate’s senior area cleric, issued a statement dismissing Ms. Shtepa’s accusations against the church as “fantasy” and slander. Villa Maria, the Orthodox church cultural center, has now been emptied of the pro-Russian fighters who used it as a recreation center during their occupation of Slovyansk. They left behind empty boxes of ammunition, empty bottles of liquor, weight lifting equipment and a jumble of leaflets denouncing the government in Kiev and its Western backers. “Today we face a choice,” read one.